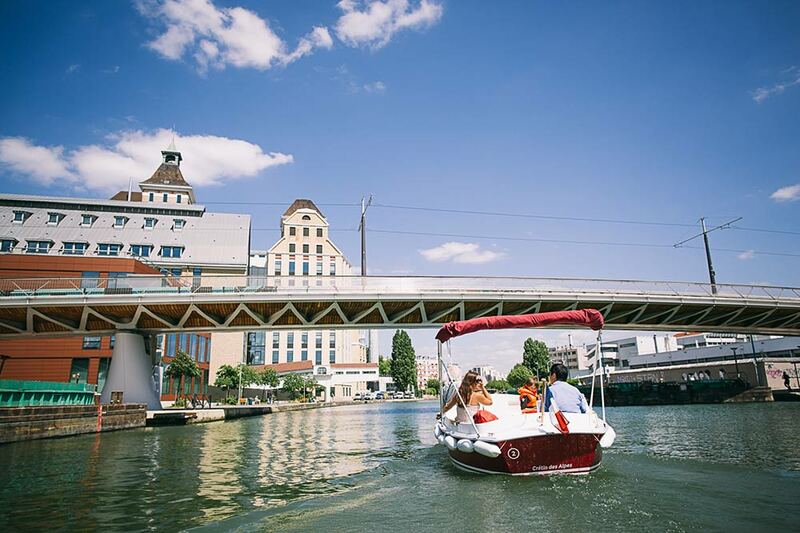 The Ourcq is conducive to all forms of tourism and can be explored at your leisure. The Canal de l’Ourcq offers a rich historical heritage set in a varied environment. 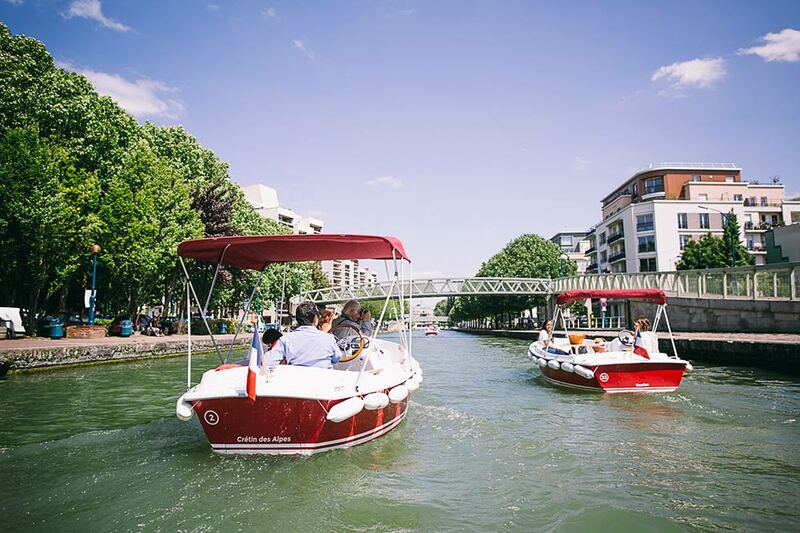 Starting from the Bassin de la Villette, you go north, passing under the hydraulic lift bridge, the Pont de Crimée, for a trip on the Canal de l’Ourcq. 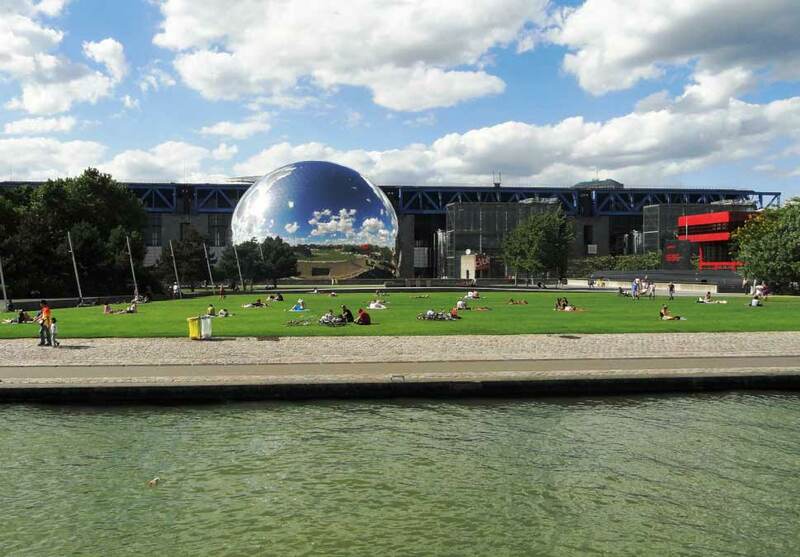 The trip along the canal begins in Paris, then you cross the Parc de la Villette passing the Geode, the old Magasins Généraux warehouses, the Cité des Sciences and the Cabaret Sauvage. You can prolong your trip by going up to the Grands Moulins de Pantin and the Thaddaeus Ropac gallery via the Cité de la Danse or the former customs houses – such mythical places! If you have 3 hours or less, you will need to turn around at the Parc Bergère, where we recommend you take a break. 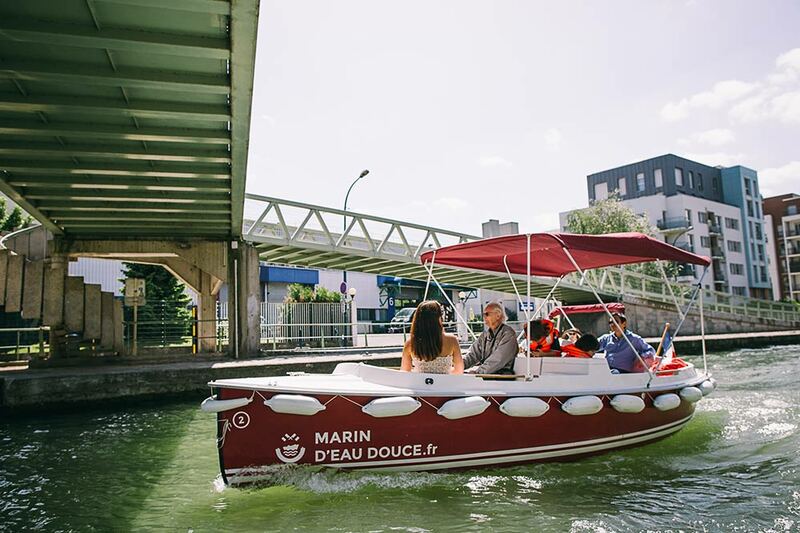 This trip is ideal for a group of friends or family because it doesn’t require any specialist knowledge of boating and provides a rapid escape from the tumult of Paris. If you want to enjoy a full day away from Paris, continue beyond Parc de la Bergère, take a walk along the Ourcq to the Parc de la Poudrerie. This is the ideal place for relaxing quietly on the grass. What could be better than a picnic, a game of badminton, pétanque or Mölkky? Your boat will be waiting for you by the bank. 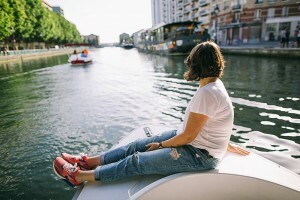 If you want to spend a whole day outside of Paris, continue your journey down the Ourcq Canal beyond the Parc de la Bergère, up to the Sevran lock, just before the Parc de la Poudrerie. On the journey, you will discover some places where you can relax in the grass. What could be better than a picnic, a game of badminton, boules or Mölkky (skittles). Your boat will wait for you while you enjoy yourself on the banks. Visitors have access to 20 km of the 108 km stretch of the Canal de l’Ourcq. This route has no locks for the first 20 km, so it is easy to navigate. 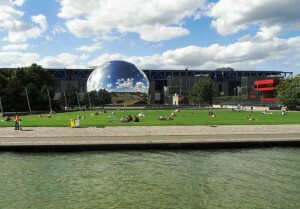 This part of the canal is changing and the Bassin de la Villette and former industrial areas are in full transformation. For example, Pantin is today promised a bright future and is considered by real estate professionals to be the next Brooklyn! Further on you will discover a natural landscape as the canal goes through the forest park of Sevran. This is a place of relaxation and recreation. The canal de l’ Ourcq was built from Paris, downstream to upstream. It provides the water supply for Paris, as well as a route for freight. This works started in 1813 between Paris and Claye-Souilly thanks to the Beuvronne waters. Two thirds were completed at the final fall of the First Empire and it was completed in 1821. To improve the inadequate water supply to the canal, it was decided to take water from a tributary on the left bank of the Ourcq. After some hesitation as to whether it should be a water supply or a navigable canal, the choice fell on the latter. The water supply remained inadequate and caused great difficulties in terms of navigation and maintaining dikes which had to resist very high tides. Napoleon III and Haussmann, the prefet of the Seine, decided to solve the problem by allowing the City of Paris to draw water from the Marne to maintain the waters of the Canal de l’Ourcq. Two water-pumping stations were built to accomplish this, in Seine-et-Marne, at Trilbardou and Villers-les-Rigault. In 1876, the City of Paris acquired the last parts of the network and started to restore the Canal the l’Ourcq. From 1860, changes were made to the new boundaries of Paris with the establishment of the Villette’s slaughterhouses and the creation of fortifications. 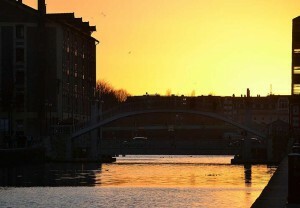 In 1871 the Communards burned buildings and structures, shops and warehouses in the Bassin de la Villette and the wooden lift bridge, the Pont de Crimée. A metal swing bridge replaced the old one. From 1880 to 1883, the Bassin de la Villette was completely rebuilt and deepened. The access channel between the ‘rond-point’ or roundabout of the canals (where the Saint-Denis and l’Ourcq canals converge with the Bassin de la Villette) and the Bassin were enlarged to a width of 24 metres and a depth of 3.20 metres which necessitated the replacement of the swing bridge with the current Crimée hydraulic lift bridge in 1885. Finally, warehouses were rebuilt on the banks of the Bassin de la Villette. In 1895, further work was undertaken to widen the canal de l’Ourcq in Paris. This was to take into account the characteristics of the new Saint-Denis canal and allow the passage of thousand-ton boats. The capacity of the Trilbardou pumping station was increased by the installation of pumps driven by a steam engine that required the construction of new buildings. This work, which took place from 1920 to 1930, changed the hydraulic slope of the canal and therefore necessitated the creation of an additional lock. 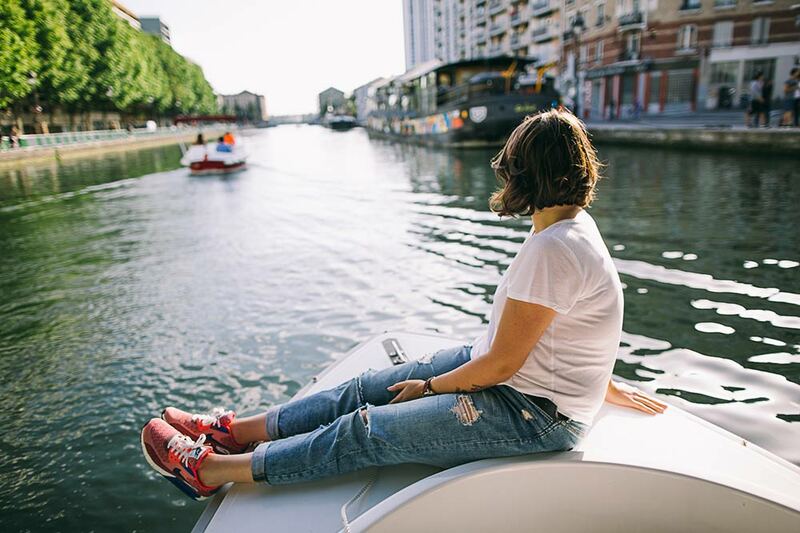 The Canal de l’Ourcq, is full of history and testimony to a continuous evolution. It features historic landmarks carefully preserved and valued, even though it continues to evolve to adapt to the needs for water supply and navigation.